Given the recent drop in temperature my cravings for comforting meat dishes grows. 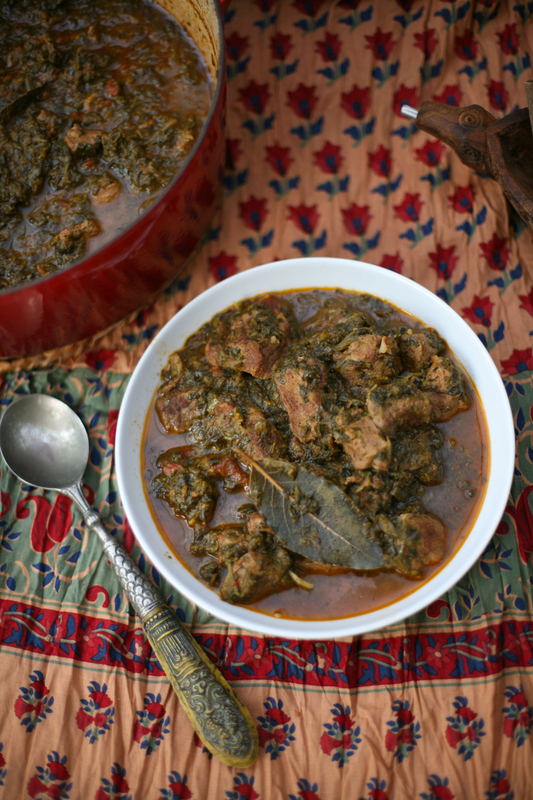 Lamb works so well in curries that through the winter months I am always digging into my recipe library (see above) to cook either my lamb keema, my rezala, which is heavenly if you haven’t tried it already, or my goat curry, which you can cook with lamb instead. 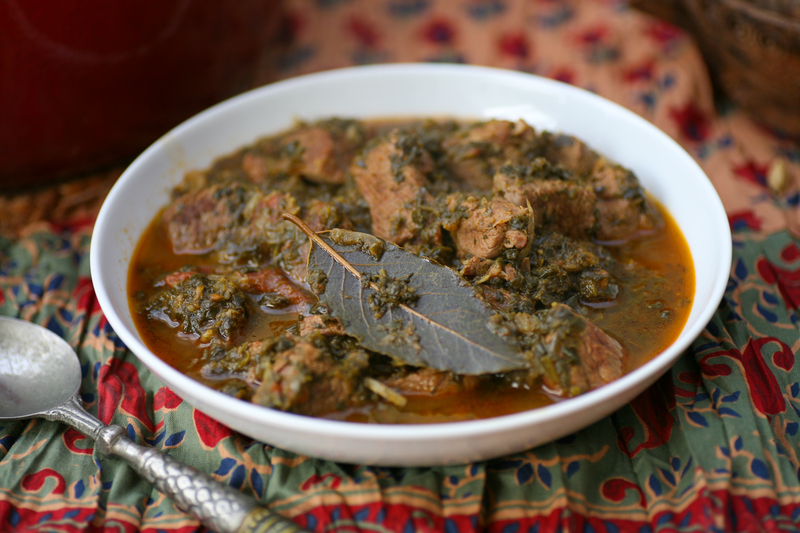 With a lamb and spinach curry on my mind I set out to buy the ingredients – most of which I had at home, however the lamb and spinach needed to be procured. I picked up some halal lamb from my local butcher, so much better priced than supermarkets I might add, which was mostly off the bone. Personally I rather like meat on the bone as it tastes so much better, but I know that it can put off some guests who are unaccustomed to eating meat in this way. After purchasing a few other sundries, I arrived home and realised that I had forgotten the fresh spinach. I decided to improvise and use the frozen spinach that I always have a packet of in the freezer. It works really well so don’t stress if you too go down the route of frozen as opposed to fresh spinach. I have a propensity to always cook more food than one can eat in a single sitting so that I can stretch the meal over two days. So whilst the meat quantity looks a lot it can be eaten in one go if you have 4-6 guests or over two days if you are feeding 2-4. As is always the case with my blog the amount of chilli you put in is up to your own individual taste. If it were just me and Mr B eating it I would spice it up a lot more than if we are sharing it amongst guests. 1. Heat a large casserole dish (or any that you can use both on a hob and in an oven) and add the oil followed by the sliced onions and bay leaves. Keep on a low heat for 10 minutes so that they soften and begin to brown in colour. If they remain translucent, increase the heat for a couple of minutes, stirring to make sure they do not burn. 2. Whilst the onions are cooking prepare the spice mix of cardamom seeds, cinnamon bark and cumin seeds in either a spice grinder (one of my favourite kitchen tools) or pestle and mortar. Add the ground turmeric, coriander and red chilli powder and place to one side. 3. Add the ginger and garlic to the onions and give a good stir. Remove from the pan and place in a bowl, whilst you bronze the lamb. 4. On a medium heat add a little more oil to the pan, if needed, lightly brown the lamb in batches. This should only take a few minutes per batch. Return the cooked onion, garlic, ginger to the pan and add the spice mix. Stir into the meat and onions before adding a little salt and pepper, tinned tomatoes, spinach and water. Heat on the stove for 10 minutes before transferring to a preheated oven set at 150 degrees ( if using a fan oven), ten degrees higher if not. Place a piece of parchment paper over the casserole dish followed by the lid and leave to cook slowly in the oven for 1hour 30mins hours, stirring a couple of times during cooking. Leave to rest for 10 minutes before serving. 5. Taste before serving to check the salt/chilli level and adjust if necessary. I find this curry is great to make ahead of time as it tends to taste even better once it has rested for a while. When you are ready to eat simply heat up gently on the hob. This entry was posted in Curry, Lamb and tagged curry, garlic, ginger, lamb, lamb and spinach curry, onion, red chilli powder, spice, spinach. Bookmark the permalink. Thanks Ken. Kind of you to say. 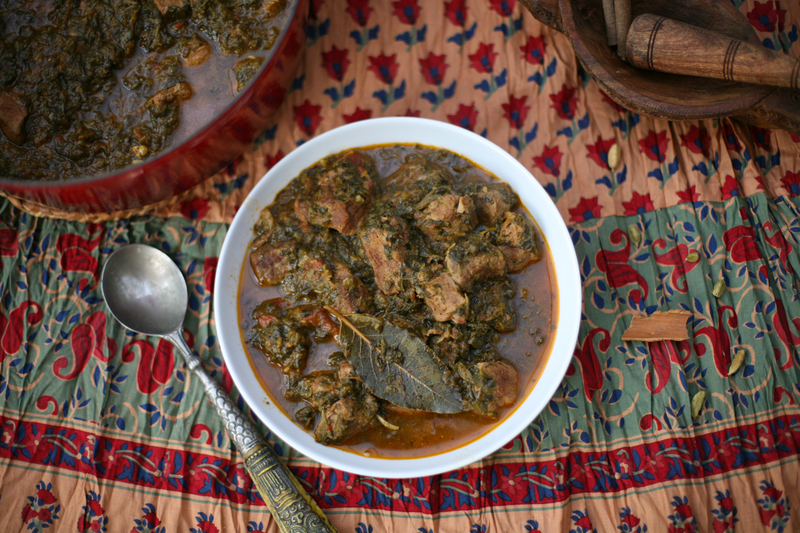 We do a lamb and turnip curry from one of Madhur Jaffrey’s books that is wonderful. The last time I made it, I added greens (kale or chard, can’t remember which – whichever the garden was overflowing with at the time). It was excellent. Hmm this sounds delicious, thanks for posting up this recipe, looks quite simple to make.